What do sustainability managers do? Myth #1 Sustainability managers must have studied ecology. It is true that Mother Nature is close to the heart of most employees that drive sustainability in their company. Some studied ecology or environmental engineering. However, many sustainability managers landed in their jobs from a broad educational and professional backgrounds. Just to name a few: economics, medicine, marketing, engineering and finance. What does this say? Companies want experienced people in senior roles hence they tend to promote people from within their organisation with relevant expertise in one of the known domains. Junior positions are open for people directly from university who studied sustainability or corporate social responsibility as a main topic. The great consequence of the diverse backgrounds is that the mix of past experiences helps to build bridges with other functions. Myth #2 For sustainability you don’t need to understand the business. Wrong. You won’t be able to steer a company towards a better societal impact if you do not know how the company is being run, how it develops, produces, markets and sells its products and services. You see companies setting goals both on profit and social progress, but both effects are created by means of their main activities: business. You have to understand how environmental and social impact can be created through the core business, and how they are related to business opportunities and growth. It also helps if you can use sustainability to support marketing and sales. Myth #3 Sustainability managers use a wand to change the organization. Not true at all! Sure, some peope may be inspired as by a flash of lighting, after seeing a movie, reading a book or article. Some sustainbility managers are gifted storytellers who dazzle their audiences. Usually though, managers who are tasked with steering higher sustainability standards must first equip themselves with rock solid science-based metrics then work hard to drive change. They have to define, roadtest and baseline well-defined KPIs and dashboards. They also must coordinate structured dialogues and reporting processes to monitor and manage change. Magic does happen. Many people are inspired, willing to make the extra mile. It however rarely involves wands. Social entrepreneurs and sustainability leaders are highly aspirational. They want to change the world through business. They themselves, however, are not always the ones delivering that message on stage. For example, people may see the CEOs of companies like Philips, Unilever and DSM talking about societal impact and business ― and they want to become a star, just like the CEOs. What many people do not realize is that sustainability folks often operate behind the scenes, influencing and changing the organization in a stealthy way through coaching, by convening internal intervention groups, shaping key notes, and advising on internal changes. Although the sustainability team is rarely on stage, there is a fair chance the change has been initiated, followed-up and followed-through by them so that the leadership, sales teams and other ‘stars’ can go out and tell that story. Myth #5 The best approach is top-down. ‘Without ambitious targets from the top, nobody will move’. This may be true and helpful in high power-distance company cultures. However, in many companies a sole top-down approach would be counterproductive. It should at least be accompanied by or even driven by a bottom-up approach. Many companies install internal networks with ambassadors and champions to co-create and roll-out the sustainability strategy, engaging people from accross hierarchies and functions. It is very important to repack, reframe and repeat the ambitions as well as share best practices on how to approach dilemma’s, how to scale up, and reward those who do a good job. It is important to set the direction from the top, globally, but translation has to be done locally. Myth #6. Sustainability management won’t be necessary in 10 years. Sustainability will, sooner or later, become part of most business functions. As companies start to articulate their societal ‘purpose’ or ‘missions’ alongside business objectives, the yardsticks and interventions will be embedded in a range of functions like strategy, finance, innovation, marketing, sales and sourcing. Sustainability will help to provide a compass for doing the right thing while doing business. It is however unlikely that the sustainability discipline will disappear completely within the next few years. Like Safety Health and Environment (SHE), quality management, supply chain management, the métier is likely to further develop and here to stay. Perhaps we will call it something else and maybe there will be multiple spin-off functions — but a central strategic, antenna, and supporting role is likely here to stay. I think we can look forward to a future of ‘Corporate Climate Warriors’ and ‘Chief Happiness Officers’ who will help take business to a new level. “Stakeholders increasingly demand transparency about the social impacts of products,” says João Fontes of PRé Sustainability. As supply chains and product life cycles span the world, businesses need a practical, reliable way to systematically analyse risks and identify improvement opportunities. “Research on consumer preferences, like The Nielsen Global Survey on Corporate Social Responsibility, shows that half of the world’s consumers are prepared to pay a premium if products have an ecological or social benefit,” says Jacobine Das Gupta, Corporate Sustainability Manager for DSM. A group of likeminded multinationals – Ahold, Akzo Nobel, BASF, BMW Group, DSM, L’Oréal, Marks & Spencer, Philips, RB, Steelcase, The Goodyear Tire & Rubber Company and a chemical company, led by sustainability consulting firm PRé Sustainability – understand the need for a social impact assessment method that is capable of screening a product’s entire supply chain across continents and throughout its life cycle. A cross-industry accepted product social impact assessment method did not exist so far. The Roundtable’s innovative social impact assessment method gives businesses the power to assess a product’s entire life cycle, scan their supply chains for risks and improvement opportunities and improve sustainable product development, reporting and communication. The group developed a Handbook for Product Social Impact Assessment which is now available as free download for any business wanting to differentiate and create value through social impact assessment, being the next stepping stone towards a future broadly accepted standard. 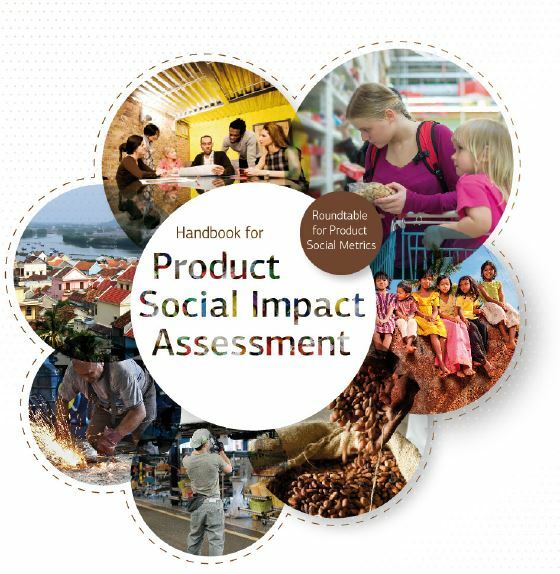 For more information see: http://product-social-impact-assessment.com/handbook/. More and more companies take an active approach to produce products in a sustainable way. But do consumers really care? 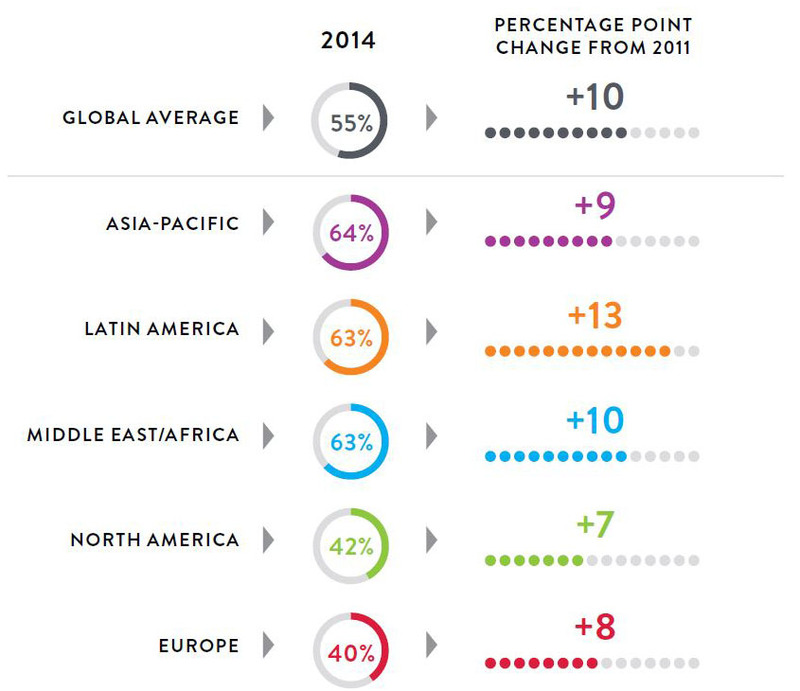 The recently published The Nielsen Global Survey results point out they do. A majority of consumers is prepared to pay more for products and services from companies committed to positive social and environmental impacts. This proportion is higher in Asia-Pacific (64%), Latin America (63%) and Middle East/Africa (63%) than in North America (42%) and Europe (40%) – and in all regions the proportion is increasing. 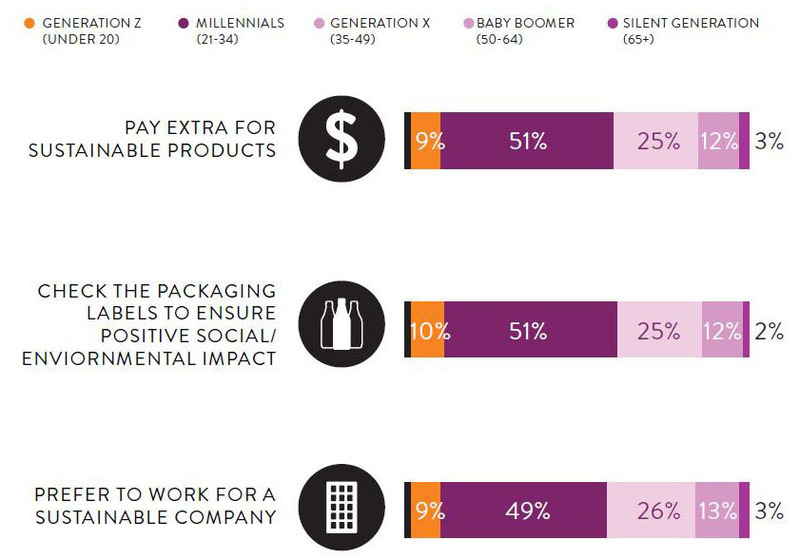 Consumers care and willing to pay more from sustainable companies. What are the social or environmental causes that get the most support? Nielsen asked respondents to specify the causes they are most passionate about. 67% are willing to pay more for products associated with an increased access to clean water, 63% that help to improve access to sanitation and 63% products that ensure environmental sustainability. Amongst the Top 10 are also ‘eradicating exterme poverty and hunger’, ‘combating non-communicable diseases’, ‘reducing child mortality’, ‘improving maternal health’. Social and environmental causes consumers care about. And it is not just about buying products. Half of the Millenials prefer to work for a sustainable company, and a quarter of the Generation X likewise. So: embedding sustainability in product development can create additional business value. That is encouraging news. Off course, just having a social or environmental cause associated with your product won’t do the trick. Old-school product-performance, a reasonable price, splendid marketing and communication skills are also essential. But if you are determined to produce great products that also support Planet and People, and you have the right conditions in place, nothing should stand in your way to create a successful business. As a bonus, you’ll be preferred employer of choice as well. If you ask people what sustainability is all about, you will probably get multiple answers. Between 2009 and 2011 I interviewed sustainability managers across Europe. I found out that sustainable development has different connotations. Interpretations are often linked to historical developments. In France, sustainability (développement durable’) has a strong social connotation. The principles of the French revolution, ‘Liberté, Egalité and Fraternité’, are still visible in today’s society. People believe that rights of individuals, employees and families should be defended at all times. You can recognize this social connotation of sustainability in the approach of Orange and of La Poste. The Swedes are known to be very close to nature. For many Swedes, sustainability is more connected to environmental aspects. You can read more about this in the case study about best practices of Ericsson. Not only national connotations may differ. Differences in business culture impact the way how sustainable strategies can be implemented in a successfull way. In France, the society is organised in a strongly hierarchical way. Important decisions are taken at top level. This allows a swift implementation of new strategies. Decisions are taken early in the process and handed top-down through the hierarchy, as is done for example at Danone. In Northern European countries, important decisions are often being made after intensive consultation rounds. These consultatations are being used to gather ideas but notably to make sure that all participants agree on the specific decision. A disadvantage is that this process may be time consuming. First: Never assume that your understanding of sustainability is being shared by everyone across Europe – let alone people in the Americas, in Asia or Africa. When you are developing a multinational sustainability strategy, make sure you understand the regional connotations and include them as much as possible. Second: Be aware of differences in business culture. Your sustainability implementation plan will need to be challenged by local experts. You will probably need to adapt it to the local business culture and decision making process in order to be successfull. Globalisation improves a mutual understanding between people in different countries. Also national business cultures may change. French organizations slowly get less hierarchical. Generation Y employees get in direct contact with company boards as the case study of the Veolia Environnement illustrates. Globalisation however needs time to develop. At date, the differences in connotations, historical legacy and business culture are still very important. Develop global, but adapt to local conditions: Test your global strategy with regional experts, and complete your strategy with regional implementation tactics, for instance in cooperation with national governments and local NGO partners, as DSM, Philips and Nokia show. More about Best Practices of European Sustainability Leaders in: ‘Your customers want your products to be green’. During the last few years I have had the chance to interact with senior managers of European sustainability frontrunners. ‘Your customers want your products to be green’ contains Best Practices of Sustainability Frontrunners such as Ericsson, Shell, Rabobank, DSM, Philips, Danone and Veolia Environnement completed with freshly printed business recommendations. Create societal impact and develop new business opportunities. More information on The Green Take website here. Enjoy and be inspired! I wish you a happy and healthy 2012! If you want to learn more about Corporate Social Responsibility, ISO 26000, GRI reporting, supply chain and reputation management : Join the International CSR Automn School from 7 to 11 November in Rotterdam. The CSR School has been developed by the Erasmus School of Accounting & Assurance (ESAA) of the Dutch Erasmus University. The Summer School targeted at CSR professionals on middle and senior management level. CSR insights will be presented by experts from around Europe. Among the speakers will be Karen Maas PHD of the Erasmus University, Prof. dr. Jan Peter Balkenende, Jvan Gaffuri of SAM (Sustainability Asset Management AG), Piet Sprengers of the ASN Bank, Alex van der Zwart of Concernz Consulting, and Jacobine Das Gupta of The Green Take.